So I started googling the best ways to pack, space saving tricks and even ways to help my little man be a better (or at least more entertained) traveler. So, in order to save you the time and trouble of all the research I had to do, I’ve condensed what I’ve learned over the summer about being a more organized, more compact, and at times more creative traveler into a few posts. Today, I’ll share about a quick countdown that made our road trip to the beach way more fun and tangible for our son to understand. Later I’ll share about how to pack a suitcase so that you can pack those extra pair of shoes and the “I just can’t decide” outfit and still not have to sit on it to make it shut. And finally, I’ll share some checklists to help make every trip you take a breeze for which to pack. The most dreaded question on a road trip with kids has to be, “ARE WE THERE YET?” It seems to be uttered for the first time as the garage door closes and continues its shrill, taunting chant before we can even get the first DVD started. I knew this was coming, especially after our first road trip in the spring with our son that was only about 5 hours seemed to double with his constant insistence that we were almost there in “3 more minutes, right momma?” So as we approached the much longer drive to the beach vacation this summer I knew I had to find a way to give him a visual for how much longer it would be to our destination. I did some pinterest searching and quickly found a reasonable project that I could handle in the 24 hours before we left – in fact it took all of 30 minutes! I made a paper chain numbered 1-9 (the number of hours our drive would be) and attached it to the headrest of the passenger’s seat so it was in front of his seat. Using Google maps I figured out where we’d be after an hour of driving, 2 hours of driving, etc. I kept this list with me in the front seat as a reference. You could easily take that part out of the project and just go by the hours on the clock, but this allowed for stops and rearranging of the schedule without running out of links in the chain. I also made a 2nd set of links to pack along with the stapler so that I could set up a chain for the ride home. I did the countdown backward that time (9, 8, 7…) so that he knew when we got to number 1 we were home. You could also throw in different colored links to indicate the hours or locations when you plan to stop for meals or other scheduled stops. 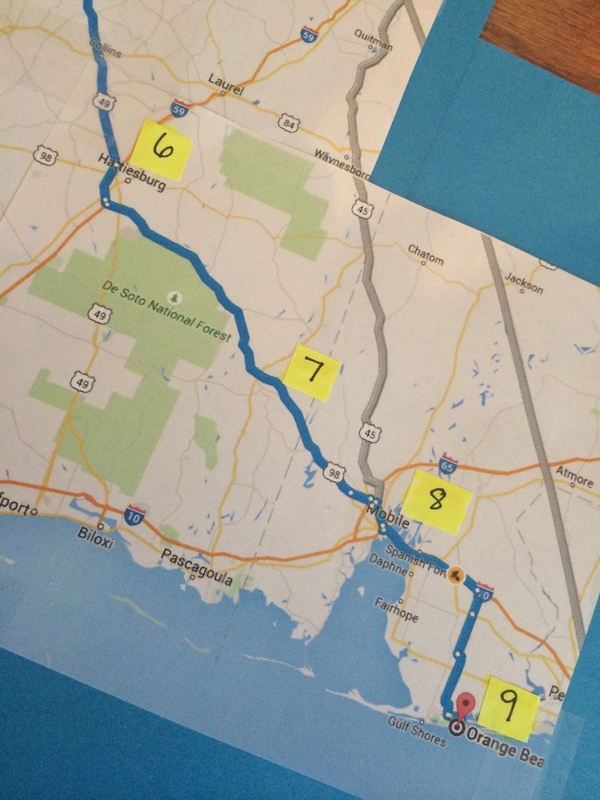 In my overachieving tendency, I made a map that corresponded to the stops. While my son was fascinated by this for about 2 minutes he didn’t really use it as a visual as much as the simple chain. This would be a great activity for a slightly older child to help with map reading and directions however. My son absolutely LOVED the chain. It helped him see that we were getting closer but still had some time to drive. When we got down to 2 links, he said, “we’re so close, but not yet!” He did still ask several times if it was time to take another one off, but I would remind him that I would tell him when it was time and he’d say okay and keep playing. We will definitely be using this again on all future road trips! Another way to use the chain would be to draw pictures (for those who can’t read yet) of errands or stops that have to be ran on a particular day. I know when we have a busy Saturday, my son likes to know the order of what’s going on, usually because we have to do some not so fun stuff (bank, post office, etc.) before we’re doing something more fun for him like going to the zoo or to lunch at a fun place. This would allow him to see what stops have to be made before we get to the part he wants the most and could possibly help him from melting down when I say we still have one more stop to make. Well, the schedule for today called for a post about the dreaded kid’s closet change over. I know you were waiting on pins and needles for it and I promise to get it back on the schedule very soon. But, I recently read something that has grated on me a bit and the routine-loving momma in me wanted to write about it. The article I read was a list of things that the author declared she was going to stop doing that “good moms” do. I’m not so sure why this article stuck with me when so many of the things I read off social media just roll off me. The word “good” might have something to do with it. That word is so hard on moms. We judge ourselves and other moms with that word all the time. Maybe putting it in the title just made it a gut punch right off the bat because that word “good” can be so black and white for so many of us when we let the guilt of motherhood take over the few rational parts of our brains that haven’t been shut down by lack of sleep already. But, my organizational, routine-loving head really started to spin when I got to the list of things that the author planned to give up doing. Now again, the title of the article implies that “good” moms will continue to do these things. But the whole premise of the article (at least in my opinion) has an undertone of judgmental eye rolling towards moms who would consider continuing these tasks. The two tasks that seemed to bother me the most that the author plans to give up are bathing her kids every day (going to a few baths a week) and having an elaborate bedtime routine. As a person who loves routine and believes that kids do well with routine and structure, I’m all about some kind of nighttime routine. Especially with younger children, I believe they need the cues of routine to know what to expect and to know what is expected of them. And, yes, I bathe my kid every day and I have since he was a few weeks old. I think it’s an important part of his routine. It’s a trigger that it’s time to start winding down and get ready for sleep (precious sleep!) It’s a way to get off daycare/school grossness and keep his bed and stuffed animals clean(er.) And, it’s a time for him to play, be silly and to ask him questions about his day when he’s not distracted by too many other things. I find daily baths and nighttime routines incredibly important for my child. I get that every family has what works for them. I guess it’s not so much about the tasks listed, in fact I could agree with some of the tasks she plans to give up. Again, I think what dug into me was more about the word “good” and the judgement that I either felt emanating from that word because I disagree with some of the points in the article. I’m completely used to disagreeing with the many articles and the lists that I run across daily. I read, agree, disagree, say “hmm,” maybe share some of them and then I move on. But, when one crosses my path that has potential to make that little dig that no mom needs but we all know is hovering, waiting on the chance for our minds to be weak enough to let it in, dig a little and plant yet one more seed of mommy guilt apparently that’s when I finally speak up. You ca n easily track an allergic reaction if there is one because you’ll know the exact days the food was introduced, not just an estimate. Everyone who will be involved with feeding your child will be on the same page. My husband and I didn’t have to worry about if one of us wasn’t at home during feeding time to remind the other what food our son had been given because we could just look. Also, you can easily take a picture and send it to grandparents and other caregivers so they also know. If you want to take it another step further when your child is eating mostly baby food, you can plan their full meals just the way you plan your family’s meals by listing everything your child will eat in a day. 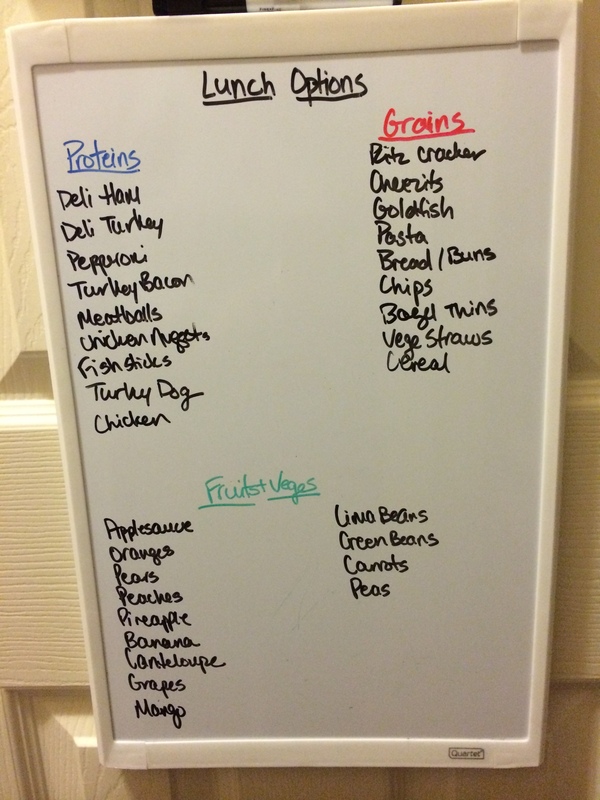 I liked doing this because it kept my son from being fed the same thing every day and it made a grocery list really east to make each week. This last step would be especially helpful for those parents who like to make their own baby food. If you make your menu before you cook, you have a clear plan for shopping and cooking ready to go. So, once you make it past the baby food stage and you get into the stage when your kids can eat just about anything that’s on the table, there’s a fantastic sense of freedom. You feel like you can eat out whenever you want (until you remember that you still have a toddler with you). I remember this sense of freedom. It was so refreshing. And then my son started a new school (that I absolutely LOVED) but it had one set back – we had to provide lunch. And not only did I have to make lunch, there were rules (again with the rules!) about what had to be in that lunch. The requirements were to provide a protein, a grain and two vegetables and/or fruits. I found myself spending way too much time each night trying to be creative while providing something my kid would actually eat and while still providing what was required. 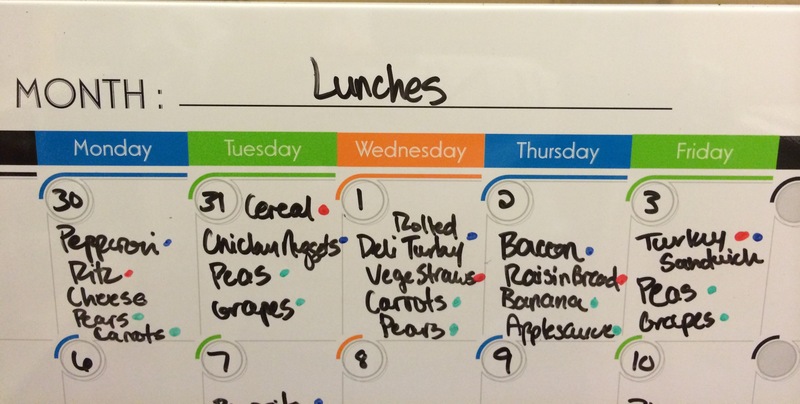 And so, the same calendar that had once directed our transition to baby food became the “Lunch Menu” calendar. 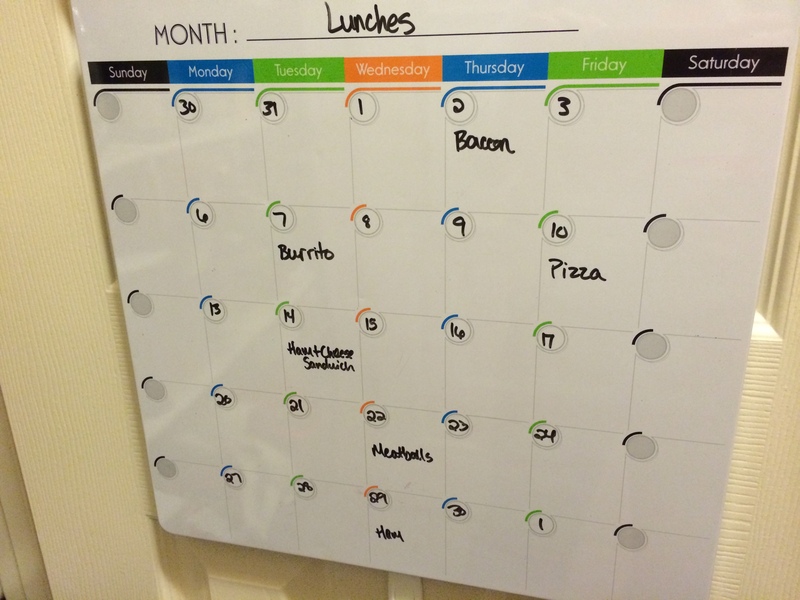 I set it up in a similar way to our monthly meal plan calendar which you can read about here. To get started you will need a dry erase monthly calendar, a small blank dry erase board, and dry erase markers in 4 colors (I have black, blue, red and green). First, I set up a master list of all the options of food in each of the categories (proteins, grains, veges, fruits). It’s important to only list items that you know your child will eat! 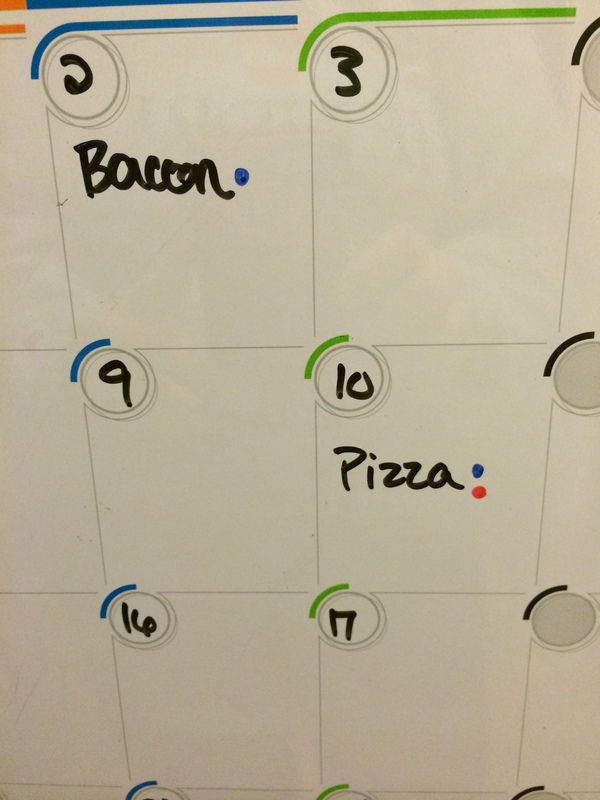 I color code each category with a color that will also be used on the calendar. Mine are blue for proteins, red for grains, and green for veges and fruit. Next, I fill out the calendar with the dates that my child is going to school. Then, I look at my family’s monthly meal plan and place any food that would be leftovers that I know my child would eat on the corresponding days on his lunch calendar. For example, if we are going to have BLTs one night for dinner, I’ll write down that he will have bacon (turkey bacon if you want to really know) in his lunch the day after. After that I go through and mark all the food that’s on the calendar so far with what categories they fall under. So, the bacon would be marked with a blue dot because it’s a protein. If it’s something like a burrito, it would be marked with a blue dot and a red dot because the meat would be protein and the tortilla would be a grain. Then, I fill in the rest of the days using the master list. I keep in mind that if I open a can of carrots that I’ll get 2 or 3 servings out of it, so he’ll have carrots a couple of times in a week. Once I’ve filled in all the food, I mark each food with its category. Then, I double check that a blue, red and 2 green dots appear each day so that all the requirements are met. As your child gets older and starts preparing their own lunches, this is still a great tool to keep them from getting burned out on the same PB&J and chips. It also helps them think ahead and plan so they can learn how to plan “recipes” and grocery lists at an early age. While this takes about an hour each month to complete (and an extra 30 minutes the first time to set up the master list of food) the amount of time and stress it saves on a nightly basis is worth it! You can go on autopilot, just look at the calendar, make the lunch listed and be done. It also makes grocery shopping easy because all you do as you are making your list for the next week is look at the lunches for the following week and make sure you have all the listed ingredients and items. AND, you should never get a pesky note that your child’s lunch had to be supplemented because you forgot one of the required food categories! Picture This: A Calendar for Kids! A few months ago I transitioned to a new job. While I was so excited about the new opportunity, I also struggled with the transition that it was going to mean for my son. He had to go from a childcare situation that was almost one-on-one and in the same building as my job to a more full time situation away from where I would be. He was soon surrounded by new teachers, new kids, new classroom, new rules, new expectations, and a new schedule. It was too much for him and it was a rough couple of months for our family. It broke my heart to watch him struggle day in and day out with what was going on, why he wasn’t going to his “old school” and all the other questions he continued to have. We were patient and we knew that it would indeed get better, but there were plenty of days and nights filled with tears – not just his! It was during this time, while my heart was hurting for my child who just couldn’t grasp all the new in his world, that I started to search for any way to give him some sense of control and consistency from day to day. One of the issues that he seemed to have was understanding the new schedule of school – some days there is chapel, some days there is music class, some days is show and tell, then some days it wasn’t a school day! So many things to remember and track for a toddler! So, I decided to make him his own calendar so we could look at it each night and he could know what to expect for the next day. Since he cannot read yet, it was important to make it so that he could understand it by himself – so I decided that instead of the traditional dates, I would use pictures to show what was happening each day. I set it up one night and showed it to him the next morning. The relief in his face was obvious and he asked a ton of questions about each picture. Now, he looks forward to the part of the nighttime ritual when he takes the current day’s square off the calendar since the day is over and then we talk about what’s on the calendar for the following day. 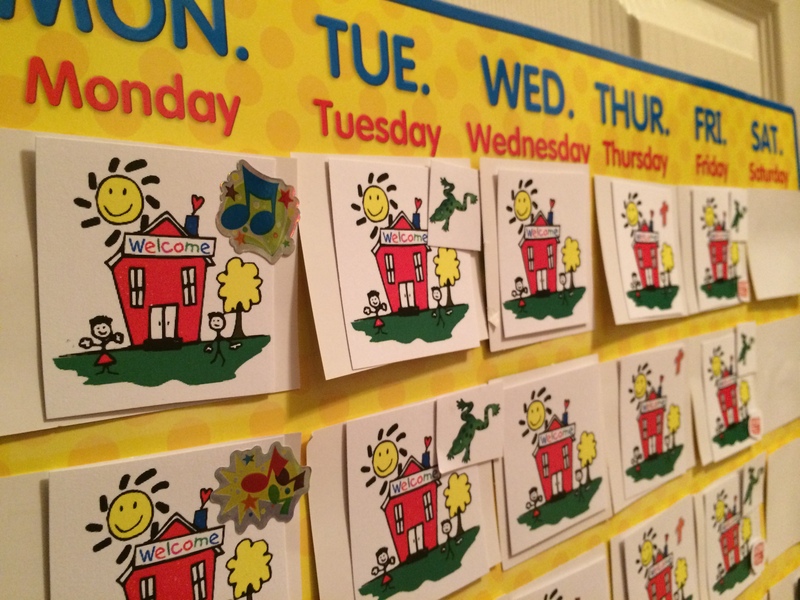 Even though he’s moved past the anxiety of his new school, the calendar is something he still enjoys because he loves to know what’s going on and what to look forward to each week. It’s also been a great way to teach about the days of the week, weekday versus weekends, and we’ve already started having the discussion of prioritizing. A recent example of teaching prioritizing: While setting up this month’s calendar, we had to take the soccer ball off one of our weekend days signifying not going to soccer practice and replaced it with balloons and a party hat signifying a birthday party for a family friend. 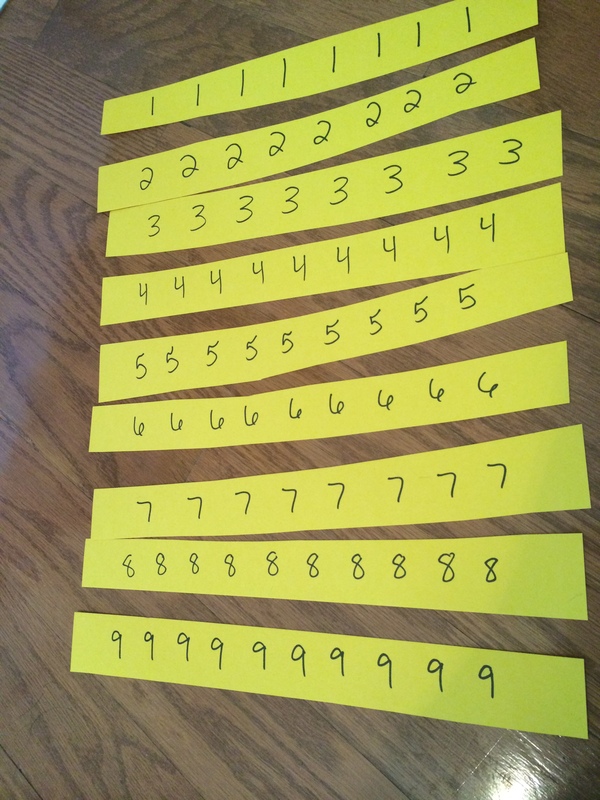 A great way to help a child learn about having to pick and choose early on before the schedule gets truly crazy! There are several ways to go about setting up a calendar similar to the one we have . I went the easy and least creative way by visiting our local teacher supply store and buying one of the calendar sets that include a calendar, titles for the 12 months, squares for the dates (I just use the blank side), etc. You could easily make a calendar out of a posterboard (be sure to get everything laminated so it can be reused!) and some patience. If you choose this route, you have fun with that and God bless you for your commitment to creativity. I’m totally jealous of your kind! 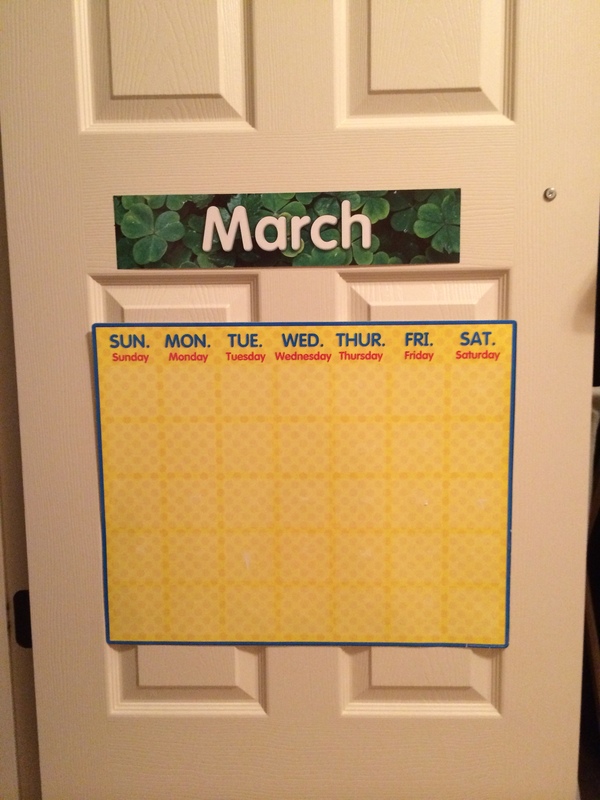 I hung our calendar on the inside of my son’s closet door in his room. It makes it easy for him it see and reach but it’s not actually taking up wall space. Before you begin, I want to remind you that this calendar is for a toddler, or small child at least. Try your best to look at it through their eyes. As you are trying to find pictures that represent their daily activities, find pictures of what makes sense to them, even if it doesn’t make complete sense to you. For example, if you have a trip to zoo planned, pick a picture of the animal that your child gets most excited about seeing when your visit the zoo instead of a generic picture of a zoo. If there’s not a picture that your child directly associates with an event or place, pick one and stick with it. They will pick up on it and commit it to memory quite quickly! 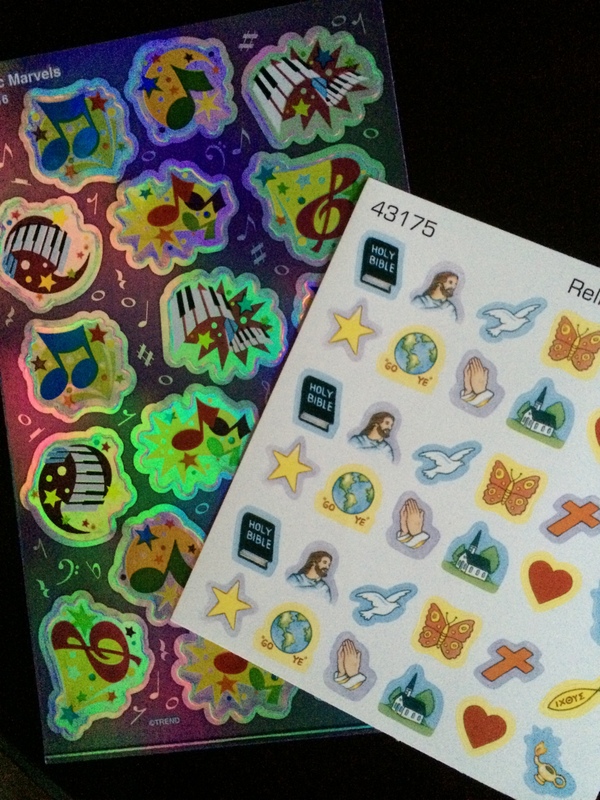 Get all your clipart for the maximum number of days possible. 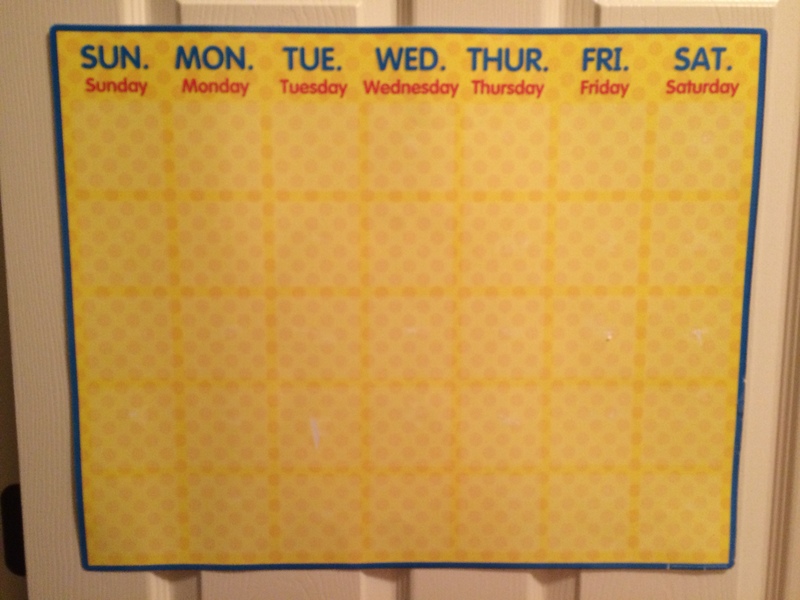 For example, I made 25 “daycare” days because that gives me plenty (with a few extra) days made to use on the weekdays . I picked a generic schoolhouse for our daycare days. I told my son once what that picture stood for and now he just knows what it means when he sees it on his calendar. Then, I added our son’s regular chore – feeding his pet frog. Soon, we will add additional chores but for now, this has works as a good reminder for what days the frog gets fed and a good way to keep the frog from getting fed every day! Once, you’ve set up the regular days that you’ll use every month, you’ll need to sit down with your calendar and see what is on your calendar for the specific upcoming month. I sit with my calendar up and a word document up and insert clipart as I come across a special occasion – a holiday, sports practice, family event (baseball game, play, etc.). Once I’ve made clip art for everything for the month, I print it, cut them out and tape them on top of the days I’ve already put on the calendar. It’s important to only put events that pertain directly to your kids on this calendar. They don’t need to have a picture interpretation of every detail of the family schedule. So, some Saturdays are just blank if nothing is happening in my son’s schedule – and that’s a good thing! Another great way we use the calendar is to help him understand when one of us (me or my husband) travel. I have printed out 2 pictures of an airplane and 2 pictures of my car. Then, on days that I leave on a trip, I put my mode of transportation and a picture of the state to which I’m traveling on the calendar. Then, on the day I’m going to return I put a picture of my mode of transportation and a picture of our house to show that momma comes home that day. As each day is taken off, I keep them in an envelope in my desk so they can be easily sorted for the next month. Now that the majority of them are made it takes me 30-45 minutes to do a new month’s calendar depending on how many pieces of clipart I have to find and if my son wants to help pull the tape off the dispenser as I’m trying to pull the new days back on the calendar! Oh, baby! No, I’m not pregnant, just to cover that one. And while we’re discussing this, no, I will not answer the question about whether we’re going to have any more children. If we do, I promise we won’t hide the child from the world forever so no worries, you’ll know. Now that we’ve covered that awkwardness, back to babies! You are probably like me in that you know someone that is pregnant (I feel like I am surrounded by preggos right now!) And pregnant people mean one thing – baby showers! Now, before those of you who don’t have kids roll your eyes and stop reading because it’s just another post about babies and showers and blah, blah, blah…I encourage you to read on because this is about what to buy for these showers – for real! Before I had a kid I was the one who oohed and ahhed over the cute outfits and spent way too much money on clothes that were not practical or toys that made no actual sense for a child until they were 2 years old. Then, I had a baby and I finally got it. The next time I went shopping for a baby shower, I ditched the registry list and bought the stuff that I wish someone had told me I needed to have on hand. Managing the madness of home, work, and everything in between.